As critical gateways for Queensland, our ports facilitate trade, enable local economic growth, and add to state and national prosperity. Our wharves and berthing facilities cater to the varied needs of our customers. We remain committed to investing in the infrastructure required to facilitate trade within our ports, to ensuring effective operational capacity and flexibility, and to maximising future growth and development in the region. Each of our ports has different facilities and services available to help make your experience run as smoothly as possible. The Port of Mackay’s existing infrastructure can accommodate 550 to 600 ships per year, with it currently handling approximately 190ships per year. It has a combined import/export cargo capability to handle more than six million tonnes per year, with it currently handling around three million tonnes per year. We have sufficient port capacity to meet the future demand we’re anticipating. a roll-on/roll-off (RORO) barge facility that can accommodate project cargoes that require barge shipping options. The Port of Mackay is situated approximately 950 km north of Brisbane. The pilot boarding ground position is 21 degrees 7.031'(S) 149 degrees 17.139'(E) (Maritime Safety Queensland 2016). The time zone is Eastern Standard Time and equates to G.M.T. + 10 hours. All ETA and other messages should be made in local time. Mackay is a proclaimed Australian first port of entry and therefore all overseas arriving vessels or installations are required to give prescribed information (pratique status of your vessel) to the Maritime National Coordination Centre (MNCC). by phone on +61-8-8201 6185 if outside of Australia through the help of your agent. The information must be submitted on the QPAR no less than 12, and no more than 96, hours prior to the estimated time of arrival (ETA) of the vessel or installations at anchorage or berth. Once forwarded to the MNCC, the information supplied on the QPAR will be assessed by a Quarantine Officer (QO). The QO will then issue the Vessel Master, through the Shipping Agent, with a Quarantine Approval to Berth (ATB), which lists quarantine directions placed on the vessel or installations. All ships are required to notify NQBP’s Port Operations Centre no later than seven days prior to arrival. Complete an online application. expected stores, visitors and crew changes. Crew members seeking access through the cordon will need to be able to present a photographic ID card, which will be verified against the supplied crew list. For the latest information on berthing applications, contact the ship’s agent or NQBP by telephone +61-7-4955 8171 or email portoperations@nqbp.com.au. Mackay tug’s VHF Channel will be advised by the Marine Pilot once they have boarded the ship for call up and are communicating with ships during berthing operations (Maritime Safety Queensland 2008). Wharf 1 currently serves as the port’s primary bulk liquid berth. It mainly handles petroleum products but also deals with tallow, ethanol, general cargo, break-bulk and dimensionally larger cargo. The wharf features marine infrastructure that can handle a container trade for ships with their own cargo cranes. Wharf 3 mostly handles bulk raw sugar. This wharf includes a travelling sugar gantry shiploader. A new diesel import facility means Wharf 3 can now handle diesel fuel as well. Wharf 4 handles bulk refined sugar, molasses and break-bulk and general cargoes. Wharf 5 is primarily used for the export of grain and scrap metal, as well as for the import of fertiliser and magnetite. This wharf can also handle break-bulk and general cargoes. Wharf 5 includes a grain shiploader and conveyor. Plus, now with a fuel import facility, fuel is also part of the wharf’s inventory. The Mackay Bulk Sugar Terminal's gantry shiploader is located on wharf #3. The entire structure weighs approximately 400 tonnes and travels along rails at 12 m centres for a length of 204 metres. It is driven by eight bogie drives and parked in storm anchors on the wharf for security during bad weather. The boom can also be locked by pins in the upright position for security during maintenance events. The shiploader is fed by a 1400 mm belt travelling at a rate of 4.5 m/sec with a sugar rate of 2400 tph. The sugar is discharged into the ships’ holds by the gantry boom belt and telechute fitted with a 360o rotating high speed thrower belt. The boom extends from the shiploader by approximately 25 m and the telechute can be shuttled along the length of the gantry. The maximum vessel size is 230 m in length and 32.2 m beam depending on the destination berth. 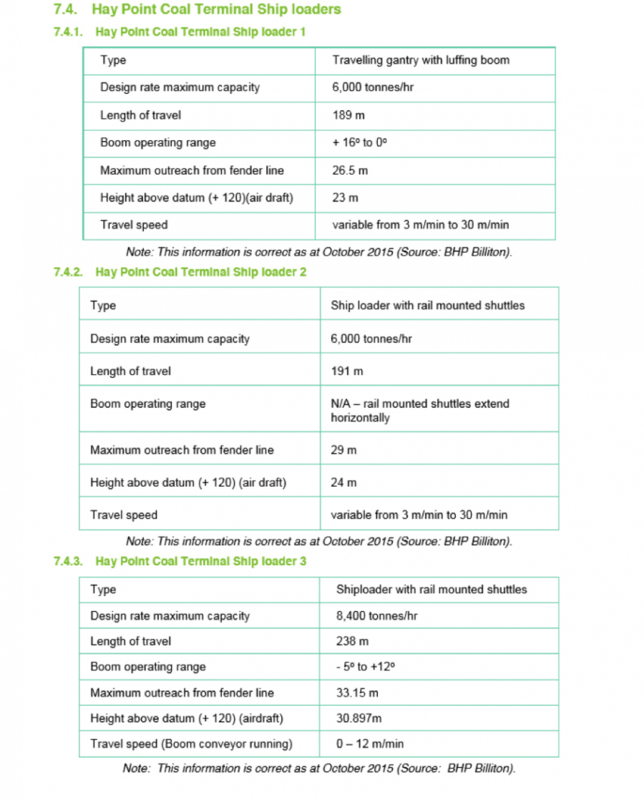 However, vessels greater than 200 m length overall (LOA) will only be accepted on a case-by-case basis. This will be at the discretion of the Regional Harbour Master (Maritime Safety Queensland 2016). Vessels are limited to having a maximum berthing displacement of not more than 55,000 mt (Maritime Safety Queensland 2016). Night navigation is permitted on vessels up to 200 m LOA (Maritime Safety Queensland 2016). For vessels above 200 m LOA, the Regional Harbour Master will make an assessment for night manoeuvring suitability, dependent on their individual merits (Maritime Safety Queensland 2016). Ships should be ballasted or loaded to have an even keel or trimmed by the stern with not more than 2.5 m stern trim and the propeller fully submerged. Vessels trimmed by the head or listing are not permitted. Ships not meeting this requirement may experience considerable delays until the problem is rectified. Masters should pay special attention to their loading/ballasting plans to ensure that their ships are suitably trimmed and able to put to sea at short notice (minimum of 24 hours), especially during the cyclone season – 1st November to 30th April (Maritime Safety Queensland 2016). The maximum size of vessel at the Mackay Marina is 50 m LOA and 20 m beam (Maritime Safety Queensland 2016). Note that vessels that have a draught greater than 3 m are subject to berth limitations. For the latest information on depths refer to the Notice to Mariners for the Port of Mackay. Priority will be given to ships carrying cargo over naval ships and cruise liners. A ship's owner, master or agent shall notify NQBP at least seven days prior to the entry of the ship to the port limits of the Port of Mackay. The notification is to be made in the form of the ‘Application to Berth’ published by NQBP from time to time and is to be sent via email or facsimile to NQBP. The right to use a wharf is subject to the arriving ship having completed all relevant documentation and being ready to load/discharge cargo on entry to the port limits of the Port of Mackay. Failure to give the notification as required by Clause 2 above may, at the discretion of NQBP, result in any berthing priority being forfeited. Failure to have all cargo accumulated immediately prior to vessel arrival may, at the discretion of NQBP, result in any berthing priorities being forfeited. Subject to the rules set out below, priority berthing between ships shall generally be determined by which ship arrives first at the Mackay port pilotage anchorage area for the nominated berth. NQBP may direct a ship to vacate a berth where, in the opinion of NQBP acting reasonably, there has been unreasonable delay in the completion of loading/unloading the ship, where the delay was caused by, or was within the control of, the owner or master of the ship or the persons loading or unloading the ship. All costs associated with a direction to vacate are to be to the agent of the vessel. If a vessel that is arranged to berth/depart cancels within 3.5 hours before pilot on board, half payment will be required. If it cancels after pilot on board, full payment will be required for the berthing operations. NQBP may vary these rules by notice to port users. Humbug Point Wharf – managed for RTA by Sea Swift Pty Ltd for the importing of general cargo (roll-on/roll-off (RORO) available). Ports North provides pilotage and NQBP undertakes regular maintenance dredging of the shipping channels. The Port of Weipa is located in position Latitude 12o 40’ south and Longitude 141o 52’ east. Time is Eastern Standard Time and equates to G.M.T + 10 hours. All ETA and other messages should be made in local time. hatch loading sequence, pour by pour. Note: To avoid delays to berthing and tug cancellations, it is important that all adjustments to estimated time of arrivals (ETAs) are advised to all parties. All hatches are to be clean/dry and opened before berthing. All loading is expressed in metric tonnes of 1,000kg. Contact the ship’s agent for latest information on required arrival notices. An Application to Berth form must be received by Weipa VTS no later than 48 hours before the ship’s estimated pilot boarding time. The ship’s agent should send a blank Application to Berth form to the ship seven to ten days before their arrival. This ensures up-to-date documents are always used. Contact the ship’s agent for the latest information on berthing applications. Tug services are provided by Smit Lamnalco Towage Australia and tug requisitions are generally made by ship’s agents. Most ship movements require the use of two tugs and there are three tugs based at Weipa. Greater than 50m LOA. Minimum parallel body length = 90m. The commercial facilities at Weipa are operated by Rio Tinto and consist of onshore bauxite handling, processing and stockpiling facilities and conveyors running to Lorim Point East and West Wharves for shiploading. Rio Tinto refurbished the Lorim Point West Wharf and constructed a second shiploader in 2005 on this wharf, resulting in an increase of its shiploading capacity. Other port facilities include Humbug Point Wharf, which handles imports of general cargo and Evans Landing Wharf, which is the centre for fuel imports. There are also berths for tugs operated by Smit Lamnalco Towage Australia that are located on the inside of the Lorim Point East Wharf. Note: There is an agreed ‘common user’ arrangement procedure for Humbug Point Wharf Usage. Ballast condition, propeller fully immersed with a forward draft not less than 2% of length overall (LOA). Berthing is normally on the flood tide. Ebb tide berthings can also be approved. Berthing is at the discretion of the Regional Harbour Master with regards to weather conditions. Berthing with a constant wind speed over 30 knots will be individually risk assessed before the terminal will accept. Engines must not be immobilised while alongside the berth without permission from the Regional Harbour Master and terminal operator. Main engine and propulsion units must be at a state of readiness while alongside the terminal at all times. A permit must be given by the terminal if the engines are to be immobilised while alongside the berth. Sailing is on the flood tide, normally about one hour before HW dependent on berth conditions and location. Minimum static under keel clearance of 0.3m is to be maintained while berthed. Minimum static under keel clearance for Weipa South Channel is 1.2m. Dynamic under keel clearance (DUKC) is in use for vessels departing Lorim Point. (RTA Terminal Requirements and Transport and Main Roads 2012). Australia’s most northerly coal port, the Port of Abbot Point is located about 25 km north of Bowen, in North Queensland. The port is of significant strategic value to the state, as there are very few locations along Queensland's seaboard where deep water (>15m) is so close inshore. The port currently has two operational bulk coal loading berths and two shiploaders 2.75 km offshore. For berthing, the pilot will board in position 19º 48·12’S, 148º 03·6’E (Transport and Main Roads 2013). The ship’s agent should ensure the ship’s details are entered in QShips (VTS) at least seven days prior to the ship’s arrival. For the latest information on berthing, contact the ship’s agent. Notes: To avoid delays to berthing and tug cancellations, it is important that all adjustments to ETA are advised to all parties. All loading is expressed in metric tonnes. For the latest information on arrival notices, contact the ship’s agent. The ship’s agent should ensure the ship’s details are entered in QShips (VTS) at least seven days prior to the ship’s arrival. Shipping agents are to communicate changes regarding proposed shipping movements to Abbot Point VTS. For the latest information on berthing, contact the ship’s agent. Vessels may communicate with Abbot Point VTS located in Townsville on VHF Channel 12. Abbot Point VTS will make initial contact with the ship on VHF Channel 12 or the Reef VTS working channel for the area – Channel 14, generally about two hours prior to the pilot boarding time (Maritime Safety Queensland 2015). As demand dictates, up to three tugs will be deployed to service Abbot Point. Specifics at any time can be obtained from Svitzer by telephoning 1300 662 377. Two ASD 80 TBP tugs and one ASD 65 TBP tug are available. Tugs’ lines are always used. The tugs are based in Bowen and take a minimum of 2½ hours and up to 4 hours to reach Abbot Point. Therefore, Masters are advised to request tugs in sufficient time, particularly taking into account that weather conditions may become unsafe, requiring the ship to move off the wharf (Maritime Safety Queensland 2010). The berth length for berth 1 is 268m. There are seven breasting dolphins equipped with Bridgestone energy absorbing cell-type rubber fenders. The height of the top of the fenders above datum is about 7.5m and the height of underside of the fenders above the datum is about 0.9m. The berth pocket is 512m long x 70m wide. 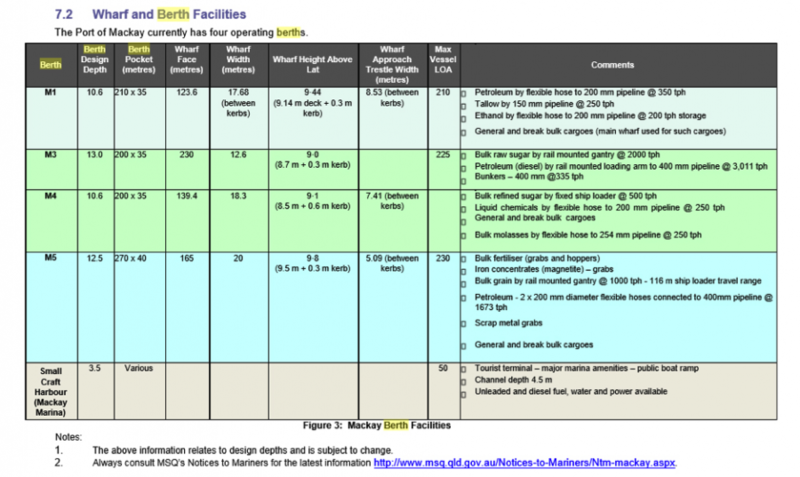 The berth length for berth 2 is approximately 252m. There are seven breasting dolphins equipped with Bridgestone energy absorbing cell-type rubber fenders. The height of the top of the fenders above datum is about 8.05m and the height of underside of the fenders above the datum is about -0.26m. The berth pocket is 480m long x 70m wide. Port of Abbot Point currently has two operational bulk coal loading berths. Port of Hay Point has two separate coal export terminals: Dalrymple Bay Coal Terminal (DBCT) and Hay Point Coal Terminal (HPCT). There are seven berths for both terminals: four at DBCT and three at HPCT. The Port of Hay Point wharf is 1.8 km offshore. Its berths are owned and operated by BHP Billiton Mitsubishi Alliance. Berth #1 is serviced by a luffing boom gantry with telescopic chute with an average loading capacity of 4,500 tph with a maximum of 6,000 tph. Berth #2 is serviced by a rail mounted shuttle boom with telescopic chute and an average loading capacity of 4,500 tph with a maximum of 6,000 tph. DBCT is leased from the state government by DBCT Management Pty Ltd. For information regarding those berths, refer to the DBCT Terminal Information Booklet on the DBCT website. All Agents, Owners or Masters are required to complete arrival and departure information direct into QSHIPS. An Application to Berth Form must be received by Hay Point VTS and either DBCT or HPCT no later than 48 hours before the vessel’s estimated pilot boarding time. The ship’s agent will send a blank Application to Berth Form to the vessel, seven to ten days before their arrival. This ensures up to date documents are always used. Contact your ship’s agent for the latest information on berthing applications at either DBCT or HPCT. Half Tide Tug Harbour is located south of the main berthing facilities at Hay Point and approximately 14km from the intersection of the Bruce Highway and Hay Point Road. The Tug Harbour accommodates the tugs that service DBCT and HPS vessels. The Port of Hay Point is one of the largest coal export ports in the world. The port primarily exports metallurgical coal, a key resource in the steel-making process.